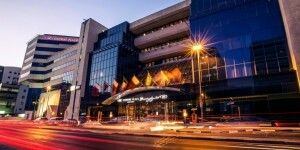 Emirates Grand Hotel - Dubai - Set in a sleek 47-storey tower, this contemporary, alcohol-free hotel is 4 km from the iconic Burj Khalifa skyscraper, the Dubai Mall and the Dubai World Trade Center. Known for its spectacular location in Downtown Dubai and just minutes from Burj Khalifa, Dubai Mall and the World Trade Center, Emirates Grand Hotel boasts unrivalled contemporary facilities in a vital location. Situated in the city’s financial district at a walking distance from the infamous Dubai metro, Emirates Grand Hotel provides the perfect base for any visit to the dazzling metropolitan Dubai. The best of business and leisure can be found in the heart of Dubai and your comfort can be found within the doors of Emirates Grand Hotel. 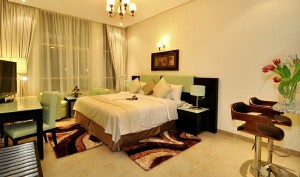 For your convenient this room can accommodate 2 adults plus 1 child below 6 year old sharing the bed with the parents. Extra bed can not be accommodated in this Deluxe Room.